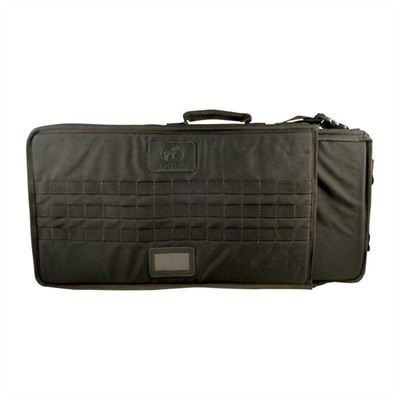 Padded, soft-side case adjusts to fit the exact length of your rifle (up to 46''''), with plenty of width to accommodate a fully tricked-out AR-15/M16/M4 rifle with a high-mounted optic and full-capacity 30-round magazine. Adjustable, padded shoulder straps of heavy-duty nylon webbing let you sling the cases over your back like a backpack for comfortable hands-free transport. Straps are positioned for proper weight distribution across your back and shoulders for maximum mobility and minimal fatigue. Adjustable, quick-release chest strap keeps the shoulder straps from slipping. Shoulder straps attach via spring-loaded clips to flat D-rings sewn to the case, so they can be removed completely and Mfg: Brownells SPECS: 1000 denier Cordura nylon shell, black or coyote. 48 (1.2m) approximate maximum extended length, 14 (35.6cm) wide, 4 (10.2cm) high.